We export Teflon cables to Afghanistan, Albania, Algeria, American Samoa, Andorra, Angola, Anguilla , Argentina, Armenia, Aruba, Australia, Austria, Azerbaijan, Bahamas, Bahrain, Bangladesh, Barbados, Belarus, Belgium, Belize, Benin, Bermuda, Bhutan, Bolivia, Bosnia-Herzegovina, Botswana, Bouvet Island, Brazil, Brunei, Bulgaria, Burkina Faso, Burundi, Cambodia, Cameroon, Canada, Cape Verde, Cayman Islands, Central African Republic, Chad, Christmas Island, Cocos (Keeling) Islands, Colombia, Comoros, Congo, Congo, Costa Rica, Croatia, Cuba, Cyprus, Czech Republic, Denmark, Djibouti, Dominica, Dominican Republic, Ecuador, Egypt, El Salvador, Equatorial Guinea, Eritrea, Estonia, Ethiopia, Falkland Islands, Faroe Islands, Fiji, Finland, France, French Guiana, Gabon, Gambia, Georgia, Germany, Ghana, Gibraltar, Greece, Greenland, Grenada, Guadeloupe (French), Guam (USA), Guatemala, Guinea, Guinea Bissau, Guyana, Haiti, Holy See, Honduras, Hong Kong, Hungary, Iceland, India, Indonesia, Iran, Iraq, Ireland, Israel, Italy, Ivory Coast (Cote D`Ivoire), Jamaica, Japan, Jordan, Kazakhstan, Kenya, Kiribati, Kuwait, Kyrgyzstan, Laos, Latvia, Lebanon, Lesotho, Liberia, Libya, Liechtenstein, Lithuania, Luxembourg, Macau, Macedonia, Madagascar, Malawi, Malaysia, Maldives, Mali, Malta, Marshall Islands, Martinique (French), Mauritania, Mauritius, Mayotte, Mexico, Micronesia, Moldova, Monaco, Mongolia, Montenegro, Montserrat, Morocco, Mozambique, Myanmar, Namibia, Nauru, Nepal, Netherlands, Netherlands Antilles, New Caledonia (French), New Zealand, Nicaragua, Niger, Nigeria, Niue, Norfolk Island, North Korea, Northern Mariana Islands, Norway, Oman, Pakistan, Palau, Panama, Papua New Guinea, Paraguay, Peru, Philippines, Pitcairn Island, Poland, Polynesia (French), Portugal, Puerto Rico, Qatar, Russia, Rwanda, Saint Helena, Saint Kitts and Nevis, Saint Lucia, Saint Pierre and Miquelon, Samoa, San Marino, Saudi Arabia, Senegal, Serbia, Seychelles, Singapore, Slovakia, Slovenia, Solomon Islands, Somalia, South Africa , Taiwan, Tajikistan, tanzania, Thailand, Togo, Tonga, Tunisia, Turkey, Turkmenistan, Tuvalu, Taiwan, Turkey, Vanuatu, Venezuela, Vietnam, Yemen, Zambia & Zimbawe. We introduce ourselves as one of the noted manufacturer, trader, exporter and supplier of PTFE wire . The best quality of raw material in a perfect ratio is used to manufacture our offered cables. These cables are precisely tested for tested conductivity, tensile strength by our dexterous professional which helped us to come up with such distinct range. These cables are available in full range of sizes and shapes at industry-leading prices. PTFE Shielded Cables. These shielded cables are produced by our experienced manufacturing team using superior quality substances and advanced techniques. The cables are then supervised by experts to check its quality. Our clients can purchase these cables at comprehensive rates to fulfil their specified requirements. Owing to our experts experience in this domain we are capable of manufacturing an exquisite range of Load Wires. With the use of sophisticated technologies and finest raw materials we manufacture these wires. The manufacturing process of these products is carried on the guidance of our professional experts. Moreover our products are also tested on certain parameters before getting delivered. We are the most trusted name engaged in offering the quality range of Asbestos Braided Cables. We use premier quality raw materials and sophisticated technologies to manufacture these cables. We have a team of skilled laborers empowered by the professional experts to manufacture these cables. Our clients can avail these from us in varied specification that too at market leafing rates. These cables are manufactured to work in heavy environment as well as in normal also. We are reckoned amongst the primary exporters and manufacturers of PTFE Insulated Silicon Rubber Cables. Our manufacturing unit is specialized in producing these insulated wires using advanced techniques and good quality resources. The insulated wires are analysed to prior to the exporting process to certify its flawlessness. Our customers are offered with these insulated wires at market leading prices within their mentioned deadline along with personalized services. Our range of PTFE Double Shielded Cables offer solution for very low levels of signal leakage. These bi and tri axial cables in this category are supplied with PTFE on the condition of attenuation stability and operating frequency requirements. Our cables are cost effective and offer great value for money. The range is weather resistant and hard wearing. Matching with the changing and growing needs of patrons, we are known for offering a wide range of PTFE Insulated Cables. The PTFE Insulated Cables we provide is used in telecommunications and can bear high voltage. These PTFE Insulated Cables are provided as per the specifications of the customers. Keeping track with latest market development, we are committed towards offering a wide gamut of PTFE Cables. The offered cables are fabricated with the help of quality approved materials like aluminum, copper, fiber optic wire, etc and sophisticated tools in compliance with set industrial standards. We offer this cable for various purposes like signal transfer, communication, instrumentation, etc. Our offered cables are made available in various specifications for our clients to choose from. In some production facilities hot conditions are prevailing. 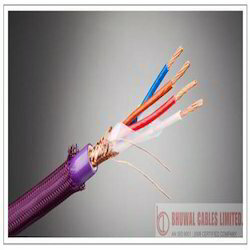 For this application range SAB Bhuwal Cables has developed the heat resistant cables and wires. It doesn´t matter if it is used in steel or plastic processing industry, refrigeration or heat engineering, air conditioning technology, in lamp industry or sauna construction. At Bhuwal Cables you will find the right cable for fixed laying or highly flexible applications. Due to the use of different materials as for example fiber glass, PTFE, FEP, PFA, ETFE, Besilen - silicone and our halogen-free core and sheath material SABIX our cables can be used for temperatures up to max. 400 °C.